Including a recording of hand bell ringing from 1934. The Lady Chapel has a fine window c.1916 by Karl Parsons depicting the Nativity, and the church has many smaller windows. Including one to the first man to shoot down a Zeppelin in World War 1. Including a copy of Æthelred's Charter of 1007, which mentions Oxhey for the first time. The present organ is a two manual instrument by Norman and Beard. 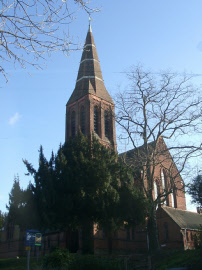 It was restored for the church's centenary in 1980.